Health And Beauty Matters is an authorized seller of Pet Alive products. 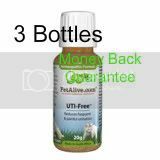 UTI-Free is a safe, non-addictive 100% natural homeopathic remedy registered with the FDA and formulated especially for pets to relieve frequent urination, bladder discomfort and urinary tract problems in both dogs and cats. UTI-Free comes in convenient, dissolvable granule form. Safe and easy to administer, these pleasant tasting granules are simply sprinkled on your pet’s tongue and rapidly absorbed in the mouth – making them easy to administer and can be used as needed for occasional episodes. UTI-Free is a homeopathic remedy registered with the Food and Drug Administration (FDA). All products are free of gluten, artificial flavors, colorants and preservatives, and are suitable for use by lacto vegetarians. In accordance with our Do No Harm policy, no animal testing is carried out whatsoever. All products are backed by our on year money back guarantee offering you peace of mind and proof of our utmost confidence in the quality, safety and effectiveness of our products. Initial Dose: Administer every 30 min for up to 6 doses a day. Thereafter, give 2-3 times daily for at least 7 days. A 10 - 14 day course of Immunity and Liver Support to strengthen functioning of the immune system is also highly recommended.